Chinchero is the centre of weaving in Peru. The colours of the rainbow can also be found throughout Chinchero textiles. Established in 1996 by Andean weavers and their supporters, the mission of the Center is to aid in the survival of Cusqueñan textile traditions and to provide support to the indigenous people who create them. The 40 adult weavers and 40 children of the community weaving association are masters in the textile art. The weavers of Chinchero have succeeded in bringing weaving once more to the forefront in their community. Chinchero is now recognized internationally as a prominent weaving town whose focus on reviving tradition has also revitalized the community itself. The weavers of the Chinchero weaving association give demonstrations of spinning, weaving and natural dyeing to visitors and run a small store that offers textiles from all ten of the communities. 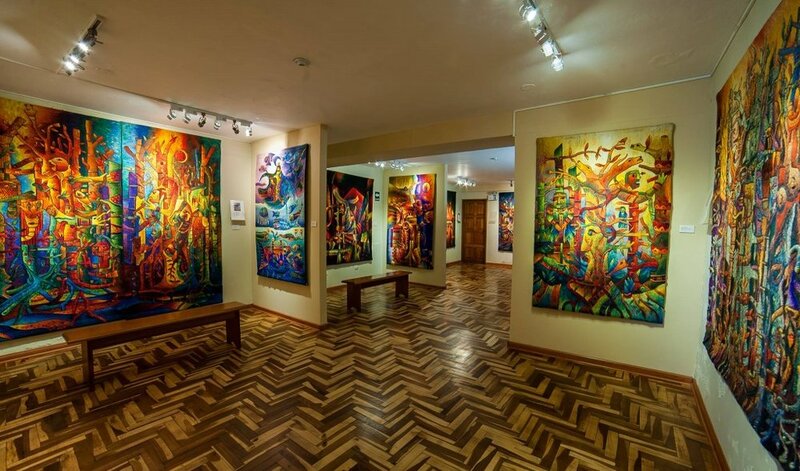 With comfortable art studios, balconies all around the rooms and large windows allowing the contemplation of beautiful panoramic landscapes, as well as an ample yard and green area, the centre is the perfect place to get in touch with the Andean indigenous culture, and let your creativity flow. Cusco was once capital of the Inca Empire, and is now known for its archaeological remains and Spanish colonial architecture. Plaza de Armas is the central square in the old city, with arcades, carved wooden balconies and Incan wall ruins. The baroque Santo Domingo Convent was built on top of the Incan Temple of the Sun (Quoricancha - the most important temple in the Inca empire), and has archaeological remains of Inca stonework. Pisaq is a village in southern Peru’s Sacred Valley region. It's known for its lively handicrafts market in the main square. A path winds from the square past agricultural terraces up to Pisaq Archaeological Park, a hilltop Incan citadel with ancient temples, plazas and the Intihuatana, a stone structure thought to have been a sundial. Views from the top stretch across the Quitamayo gorge and surrounding valley. Maximo Laura is an award-winning tapestry weaver, internationally recognised as one of South America´s pre-eminent and most unique textile artists. He is a consultant, designer and lecturer on art and contemporary Andean textile design. His work is the integration and synthesis of ancestral weaving techniques, symbols, memories, myths and rituals with contemporary art. Sacsaywaman is a citadel on the northern outskirts of the city of Cusco, the historic capital of the Inca Empire. Sections were first built by the Killke culture about 1100, the complex was expanded and added to by the Inca from the 13th century; they built dry stone walls constructed of huge stones. The workers carefully cut the boulders to fit them together tightly without mortar. The site is at an altitude of 3,701 m (12,142 ft). Puma Pukara is a ruins of a fort made of large walls, terraces, and staircases and was part of defense of Cusco in particular and the Inca Empire in general. For many visitors to Peru, a visit to the Inca city of Machu Picchu is the highlight of their stay. In a stunning location, it’s the best-known archaeological site on the continent. This incredible ancient city was never revealed to the conquering Spaniards and was virtually forgotten until the early part of the 20th century. The site invokes an air of grandeur and mystery, and is a must for all visitors to Peru. Loosely translated as "palace of weaving", Awana Kancha provides an opportunity to see products made from start to finish from South America's camelids (alpaca, llama and vicuña). Feed the animals, watch the shearing, enjoy demonstrations of the textile weaving and dyeing, and shop for the finished products in the showroom. The cost of the tour is £2,550/US$3300 per person. £2900/US$3800 single occupancy. A deposit of £750 is required to secure your place. The balance is required 2 weeks before travel. All transport associated with the itinerary including transfers from airport to hotel, hotel to hotel and back to airport. Items of a personal nature, laundry etc. Participants MUST have travel valid insurance, preferably including insurance covering altitude (Cusco is 3500 meters above sea level and the Sacred Valley and Machu Picchu 2800 metres above sea level), before being accepted on the tour. Trip notes and other documentation will be sent to you prior to the tour. Extensions are available to study further at both the Apulaya Cultural Centre in Calca and The Centre for Traditional Textiles in Cusco. Subjects include Knitting (advanced in Cusco), backstrap weaving, spinning etc. We can also arrange accommodation for you in Calca, Pisaq or Cusco if you wish. These services would be provided at cost price as a courtesy to you and your transfer to the airport at the end would still be valid.